Sveta and I traveled in September. We rode in the train for nineteen hours from Mykolaiv to Lviv, northwestern Ukraine. There, we met the director of an orphanage for children with disabilities that is located in the village of Veleeky Lubin. He and his driver took us to the orphanage to investigate their needs in respect to the philosophy of MUCH. From there we rode in a bus to Cambir where we changed buses to continue on to Dobromel, a total of two more hours. After spending five days with the children of the Dobromel Orphanage, we rode in a bus to Lviv, and then in the overnight train to Kiev. There we stayed two days with friends who coordinate the Ukraine Challenge mission. It is always good to talk with our friends and other Americans who are visiting on short term mission trips. Stepan Yoceepoveech, the director of Veleeky Lubin Orphanage, showed us classrooms, their medical rooms, a fully functional dental room, and the playground. He and his wife, who is the nurse, shared a small lunch with us. Sveta’s and my goal was to see if they had needs similar to those at the Dobromel Orphanage. It was very clear to us that they had all of the material equipment that they needed. So, how could MUCH help? The same as the Dobromel Orphanage, they did not have additional teachers to teach computer classes. They have a beautiful computer room. It seems that the government likes to give the appearance of a fully operational orphanage, but in reality, they are not interested in committing money to the monthly cost of additional teachers for the program. They do not have a massage therapy program for the children, but they do understand the need. We are investigating different possibilities. For MUCH to begin new programs, after they are approved by the Board of Directors, such as funding a computer teacher and/or a massage therapist, we will need more regular monthly support. The support that operated the clothing program in Marganets that we recently closed will support one massage therapist at $100 per month. We would need an additional $62 per month to support a computer teacher. If you have friends who are passionate about children, particularly children in Ukraine, please share our story with them. 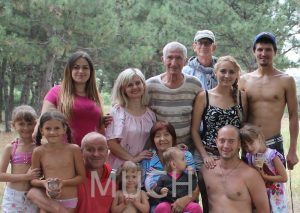 Sveta will share about our time with the children at the Dobromel Orphanage in Sveta’s Journey. 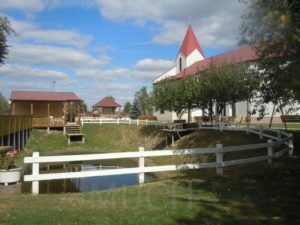 Our time in the Kiev area, north central Ukraine, was centered in Voronkiv, at a church camp. The church provides camp for three weeks in the summer for children with disabilities. Buddy and Janada, coordinators (and much more) of Ukraine Challenge (UC), took us to visit three other churches that UC is sponsoring. These churches are in the process of being built or expanding. It was exciting to see hunger for the Gospel of Jesus Christ in these villages and small communities on the edges of cities. We talked about many things with Buddy and Janada. Most important to me, we talked about our purpose as missionaries in Ukraine. Their twenty-one year of service to Ukraine and our fourteen year of service to Ukraine approach the same goal. We are helping the people of Ukraine help themselves to live the Gospel of Jesus Christ through action and word. It is an honor for me to be a missionary in Ukraine, being part of this country in the midst of change. The Dobromel Orphanage is my favorite place of all the places that Mark and I visit. Maybe it is because I lived in the orphanage while I gave the twenty-day massage therapy demonstration that started the program there. I always look forward to meeting with the children and our team of two massage therapists and two teachers for the computer classes. Children greet us, and every day during the week we hug them, talk with them, and take their pictures. Whenever I hug the children, I use this great opportunity to pray for them and bless them. I see in their eyes a big need for love and acceptance. 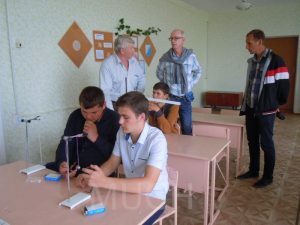 This year, the Ukrainian Ministry of Education (MOE) has finally created an official computer class and provided a teacher. The program created by the MOE teaches theory only, and is taught only two hours a week. When the teacher began her first class, she was very surprised to see what the children already knew about the practical application of computer. Because she was hired by the MOE, she is required to teach the given curriculum. 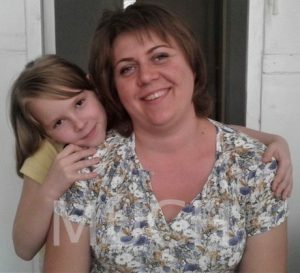 Therefore, the two computer teachers, Olga and Luba, supported by MUCH, will continue their work. Our teachers work with the children five days a week for one hour each day. It is important for these children to learn and apply their experience every day. It is so wonderful that Olga and Luba can choose the programs which are necessary for their particular group of children and also create an individual plan for the different learning style of each child. Olga not only teaches children computer skills, but she also encourages each child with hugs and words of encouragement. She builds nice relationships of trust with the children. Volodya continues to change. I was surprised when I saw this former fidgety, naughty, and wild boy in the computer class. During the whole lesson, Volodya was doing his work patiently and diligently. He was proud and happy to show us the text which he typed. It’s so wonderful to see such a huge change in the lives of these children! Olga takes a short break in the middle of the lesson. With her fluency in English, she combines learning English words and sentences with physical exercise. The children surprised us with how quickly they grasped what they were taught, in spite of the mental limitations of some of the children. Olga has a great love to help the children. She takes an individual approach with each child. Luba teaches her computer class in the library. She has a beautiful maternal love and patience for the children. She is instinctive about what programs will help them in the future. In her library, she uses older computers which sometimes lock-up. This causes the children to become upset because they cannot continue their work. They have to turn off the computer and reboot it, taking computer time away from them. When this happens, they look at their classmates with envy. She also works with two computer tablets provided by MUCH. Luba uses these tablets to work with non-verbal children like Misha. We wrote about him in previous newsletters. This visit he surprised us! He learned several words and began to understand some of the actions that Luba taught him! It is not so easy to teach children like Misha. It requires patience and waiting for the results. Luba has a lot of patience! With MUCH money we acquired a printer for the library computer class. Children learn to print text and photos with great pleasure! Olga and Luba began the first month of the school year with a review of what they taught last year. It is common for children to forget over the summer what they learned during the previous school year. The children surprised their computer teachers with how much they remembered. It is obvious that the children want to learn how to use the computer. They are very interested in using the computer and are showing great results. 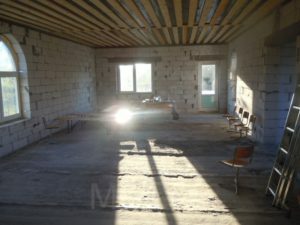 Mark and I saw many physical changes in the orphanage at Dobromel. One example is the newly remodeled adjoining rooms that were created for the massage therapy and exercise programs. A wash basin was also installed in the room for the therapists to wash their hands between massages. The director of the orphanage always has a vision to improve the quality of life and rehabilitation for the children. The government does not always support his vision financially. With money from MUCH, we helped move some of his projects forward. In future newsletters we will talk more about these projects. We thank all of you who make our mission a reality! Without your prayers and financial help we could not carry on with our work. 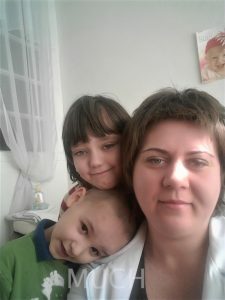 This entry was posted in Changing children's lives, computer, Dobromel, education, Financial sponsors, Orphanage, Special needs children, Ukraine orphanage on October 13, 2016 by Sveta Koehler. 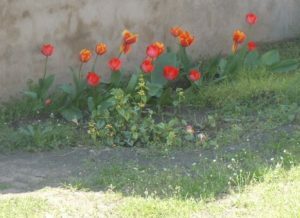 The flowers have popped up, green has flooded our yard, and the fruit trees are all in bloom. Spring has arrived and the warm weather is not far behind. What good has come from the war in eastern Ukraine? There are new laws in Ukraine created to remove all images connected with Soviet times. The statues of Lenin are being removed from all cities and communities in Ukraine. The removal of the symbol of the hammer and sickle is also a major change. A change that you will see in our newsletter, Google Maps, and other professional references, is the name of the city of Illichevsk, the home of MUCH massage therapy. The new name is Chornomorsk, which translates as Black Sea. Illichevsk was named after Vladimir Ilich Ulyanov (Vladimir Illya Lenin), using his patronymic (from the father’s first name), Illya. These are the first steps in changing the face and the heart of a country. Sveta and I went to Chornomorsk recently to visit the massage therapy and transportation scholarship programs. Sveta will write about our visit to the massage therapists. At the Thursday evening service at the Baptist church, I spoke about the MUCH Transportation Scholarship Program. We operate the program through this church. It is always a pleasure to visit with this community. We visited the two university students in our program, Nastya and Natasha. It is so great to watch them grow and mature. I spoke with Nastya who is studying to be a conductor of music. I see positive change in her personality and confidence. She is very happy for the help that MUCH is giving her and thanks all of the sponsors of MUCH for providing funds for transportation to the university in Odessa each day. Natasha has one more year of university to complete her degree in English to be a translator. She is very excited about the job that she has in Odessa. She works at the Black Sea hotel at the front desk. Her English skills are very important, as the hotel attracts many tourists. She sends her thanks to all of the sponsors of MUCH. Children’s ministry has not been a part of the MUCH Program. We do have a great desire to add help for the children to connect with God. During our fourteen years of working with the children, we have definitely “won the right to be heard”. We are beginning a process of finding a short or long term missionary to join us in that capacity. 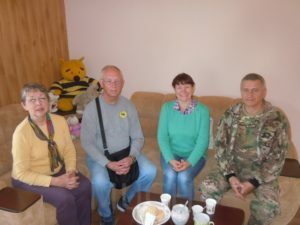 We were introduced to a Ukrainian at the home where we rented a room during our stay in Chornomorsk. Alla, a young woman, is a pharmacist who has a passion for children’s ministry. When I asked about sharing her passion with the children at the Dobromel Orphanage, she showed a growing interest. We have invited Alla to visit the children with us in September. Sveta and I are very excited about what God will do through Alla. We anticipate that she will travel with us once a year. Spring is the time for work in the garden. This is the time when we sow seeds in the ground and expect harvest. Whenever I work in our garden, it reminds me of the children. Children, as the soil in the spring, are ready to receive all that is sown. In this great time of childhood we are able to sow good seeds for the future of children. When we focus only on our needs, it does not fully satisfy our emotions. When we see the needs of others, we enrich our inner satisfaction. I believe that your giving and prayers enrich your essence. For many years, the parents of 11 month old Anna, dreamed about a second child, but nothing happened. When the wife was 44 years old, their son was 25 years old. Last year, this woman was diagnosed with a tumor in her uterus. Of course, she was very upset and even came to the idea that maybe it was her time to die. She shed many tears, and many different thoughts ran through her mind. In the process of a second opinion, it was discovered that she was pregnant! No one expected this, and no one thought it was possible. So suddenly, everything changed! The girl Anna was born prematurely, at eight months. On examination she was diagnosed with a weakness in her complete muscular system. When she would cry, her abdomen around her belly button would protrude. Tanya began to give Anna massage therapy at the age of two months. During nine months, Anna has received five, ten-day courses of massage therapy. The last time the child was examined by the doctor, he canceled the diagnosis originally given. The girl’s muscular development has improved. Now when shy cries, her abdominal muscles hold tightly. Anna, in all parameters, corresponds with normal development. Anna’s mother was very happy and grateful to Tanya and MUCH sponsors who fund this program. Dr. Natalia always sets achievable goals and meets them. She sees potential for one-year and seven-month old Paul. The child was born with the diagnosis tetra-paresis (muscular weakness of all four extremities). Paul could not sit, crawling, or walk. But after seven days of massage therapy the child began to roll to the side with a little help. He began to take a toy with his left hand and shift it to his right hand. Dr. Natalia relaxed and strengthened his hip and shoulder joints and then increased range of motion in these joints. During work on his joints, the boy cried. This is a very painful procedure, but it is necessary. Dr. Natalia taught his mother to do special exercises at home. She said that for this baby, ten days of massage therapy is necessary, and then ten days of rest. This will develop the production of motor skills, making the proper neurological connections. This must continue for at least six months. Massage therapy and computer classes are changing the health and education of the children at the Dobromel Orphanage. Massage Therapy and the Transportation Scholarship Program in Chornomorsk are giving new opportunities to infants, children, and college or university students. In Marganets, children’s lives are being changed in big ways in three different organizations though our Clothing Program. The children are changing from disabled to more abled, less teachable to more teachable, and poor self images to better self images. We are grateful to God that He blesses all of these programs, and we see how He acts in His love! We also are overwhelmed at how He is providing for all of these things through you, our faithful supporters. Thank you! This entry was posted in Massage for children with disabilities, Special needs children, Ukraine Missionary and tagged achievable goals, second opinion on August 8, 2016 by Mark Koehler. It has been hot recently, in the mid 90s. But, then again, it is summer. Sveta has coaxed me to swim in the sea a few times this summer. The water has had a cool temperature, just right for swimming. The ½-mile long beach has been packed with vacationers from Western Europe and Russia. The Illichevsk beach remains free, although it has become very commercialized. There are many ways to spend your money. My focus this summer is to write articles on Sveta’s and my blog about the education needs of the children. My series begins with “What About Education? – Intro,” and, if you are on the Internet, you can find it in the second article, Wednesday July 11, on this page http://tinyurl.com/bqevdjv. With each article, I am building the foundation of environment and need of the children in Ukraine. This series will come to a conclusion soon, and will be followed with a series on Health Care and how MUCH is involved. 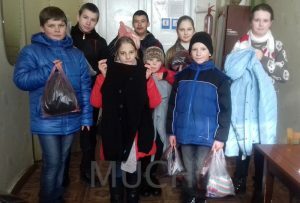 MUCH is not an organization created to educate the children of Ukraine. It is our intent to evaluate what is current, and be a catalyst for inspiration or change to create opportunity that will improve the options of the children. Here in Illichevsk, our Transportation Scholarship Program (TSP) does this. Our long-term goal is to alter society through education. Our focus is not to teach our thoughts and beliefs, but rather to encourage and challenge the children to continue on to higher education that is already waiting for them. I believe that this will break the cycle of poverty, giving the teenagers a bigger picture of what is available for them to do with their lives. With a picture of something more than their past lives and how they were raised, these teens will not only have the opportunity for higher education, but will realize that there are people who care enough about their future to help them. Some of the teens who do want this are not able to afford the transportation to and from Odessa every day. That amount is about $2.50 a day for an hour of travel each way! Imagine that! In Marganets, the staff and administration are committed to the 156 children in their orphanage. It is government-run, but this one is operated so much better than others in Ukraine are. Their focus is to challenge the children to find their highest abilities and excel. For some of the children, these areas are in computer or music and dance. MUCH believes that these classes are preparing the children for their futures in a bigger perspective, developing thought processing and new patterns of thinking, which were touched on in the June Newsletter. 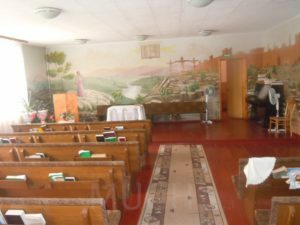 A third course of study that MUCH supports in Marganets is provided by a local church. In the beginning, we asked them to meet with the children and teach about morality and self- respect, with a focus on prevention of drug and alcohol abuse. For children in an orphanage system, this can be the biggest influence on their lives. Taught by loving teachers, the children can develop character that will carry them through the difficult times that they will face in their futures. MUCH has been influencing the lives of children in Ukraine in these ways for six years. Our desire is to expand our education programs and inspire the teachers to do more. The government is not likely to add to the budget, so MUCH sponsorship may be the only way to express to the teachers that we care about what they do. Several months have passed since we met with the parents and their daughter, A., in their home. This time, while visiting the massage clinic and the doctor/masseuse Natasha B., Mark and I saw good results from A. Her parents give a lot of attention to the child. 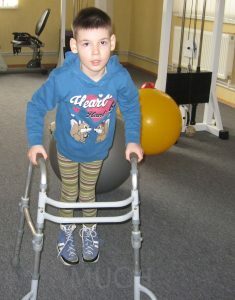 Four times a year A. is being treated in a children’s multi-therapy clinic called “Golden Angel” in Odessa. She receives medical treatment and massage therapy, and during the summer, the parents bring A. daily to an Equine Therapy program near the town, where she rides a horse in a small walking circle. Contact with the horse gives A. many positive emotions, helps relax her spastic muscles, and builds tone in her legs. Contact with the horse warms up the muscles and joints of the legs and pelvis, and also develops coordination. The girl is very patient and she is accustomed to numerous procedures, training, and massage. Her parents are actively involved with the child at home. They use a special suit that holds the muscles of the extremities in the correct position. We reported on A. in the February Newsletter that she could not raise her head. During this visit, she is able to raise her head and hold it in a raised position for a count of 60 seconds or more. This is great progress. D., an eight- and-a-half year old, is a very interesting and clever girl. She is an extraordinary child! When she learned that Mark would be at her massage treatment, and that he would be taking pictures of her, she carefully prepared for the meeting. She wore her best dress, jewelry, and her grandma braided her hair beautifully. D. met Mark about 4 years ago, and she loves him very much. When it came time to say goodbye, it was clear that D. did not want to part with Mark. She has Cerebral Palsy, but she goes to a regular school and has almost no free time. She regularly receives massage treatments and visits a dance choreographer for lessons in stretching muscles. The stretching exercise is very hard work for her. Currently, D. is interested in working with beads. She showed us her work, a beautiful bracelet for her wrist. D. loves animals, especially horses and dreams of working with them in her future. Two years ago, D. underwent surgery to lengthen the muscles in her left heal cord and her right hamstring, behind her knee. Before, she could stand only on her toes. After the operation, she is now able to stand with her foot almost entirely flat on the floor. She receives a single injection of a medication called Disport, to relieve spasticity of her leg muscles once or twice a year, depending on the results. It costs 1500 grevnya ($187.50) per dose for her. Currently, MUCH is not involved with the cost of this injection treatment. It is very important when doctors and parents notice the child’s deviation from the norm in infancy. Actions taken in time, especially before the child reaches the age of one year, can greatly alter the development of the baby. M. began receiving massage treatments when he was one month of age. He is now 1 year and 8 months. During this time, his muscle tone has been restored. His mother is delighted with the good results, and understands the importance of massage for him. V. (right) has hemi-paresis, and he began to receive massage at the age of three months. Now he is two years and four months old. During this time, he has received massage treatments and also has good results. massage as mandatory. He states that it is very necessary to receive massage as an important means to help restore the function of his body. He is a beautiful child! Thanks for your help! You are sincere and good people. You are well aware of the complexity of situations and in the past have been ready to provide much needed assistance. Charity is one of the most important works in society. With your help, needy children receive timely assistance and can always count on your support. People involved in charity, by helping others, get moral satisfaction from their work. You will be hearing more about our efforts toward education and health care as we enter the fall season. MUCH is made up of many different people. I am only one here in Ukraine who moves things forward. There are thirty-one people of Ukraine, in three cities and two villages, who are involved to some degree in making the work of MUCH happen. In America, the MUCH board of directors guides my financial decisions here in Ukraine, and the sponsors of MUCH make it possible to carry out the work that God guides me to do. Finally, but equally important, are those who lift us up in prayer in America and here in Ukraine. The children thank you all! 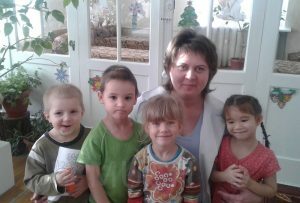 This entry was posted in Changing children's lives, Early Intervention, Massage for children with disabilities, Special needs children, Ukraine Missionary, Ukrainian missionary on August 23, 2012 by Mark Koehler. July is the hottest month in the summer. A few days ago, it was in the mid 90s, but today it is back in the mid 80s. Mornings and evening are wonderful times of day to walk, strolling through the park, or walking by the sea in the cool breeze. This pleasant weather will slip away before we know it, but that is the life we live here in Ukraine, by the Black Sea. 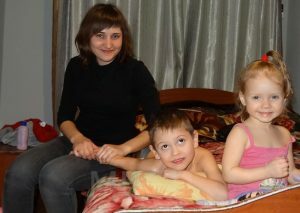 Each month, Sveta and I share stories and pictures about the children in our newsletter. A week or so ago, I started two new ways to tell our story, using the internet. Flickr is a site that allows people to share pictures. We decided that we needed to have a system to share pictures with all people who are interested. At this point, we have 200 pictures organized in 15 sets, starting with the Marganets Orphanage in 2002. 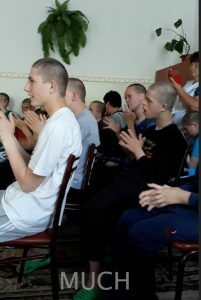 We also have sets of pictures from the Illichevsk Massage Program, the Dobromel Orphanage, and the Froonza Massage Program. You are welcome to visit our sets at http://www.flickr.com/photos/muchhope/. When you look at our pictures, if one moves you to write, please leave a comment. Tell us what you think. If you don’t have a computer, there are computers at the library and one of the clerks will be happy to help you. Do you follow Facebook? We recently created a page for MUCH. We have pictures, not as many as Flikr, but we have them on a timeline, beginning with the creation of MUCH in 2004. If you have a FB account, you may comment on the pictures, click the Like button if you like our page, and you may write something on the status entry, Facebook’s “What do You think?” If you don’t have a FB account, which is free, you may still browse through the page, clicking on the pictures and reading the comments. You may find our MUCH Facebook Page at https://www.facebook.com/smMUCH. We hope to hear from you soon! Big plans are in the works for the coming year, beginning in the fall. With our three main focus points — healthcare, education, and clothing –we want to increase the number of children that we are helping in education and healthcare. 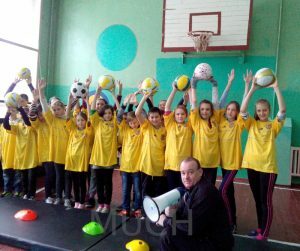 Our Transportation Scholarship Program is the heart of our dream to break the cycle of poverty in Illichevsk. Our different massage programs are showing great results. 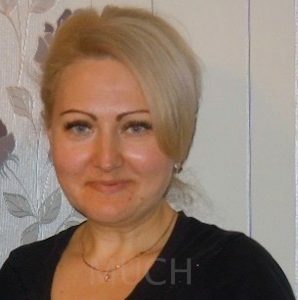 My personal vision is to add three masseuses to the massage programs, one in each city, and four children to the Transportation Scholarship Program in Illichevsk. Success of my vision will depend upon our current sponsors and new sponsors that we hope to find via the internet social media network. Follow us on Facebook, Twitter, and Flikr, to see how we do. I will tell you more in the August newsletter. Sveta has some interesting insights about life in the day of a child in the Dobromel orphanage! 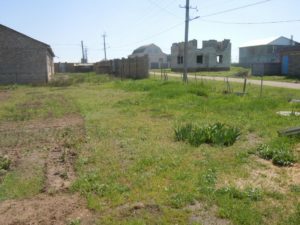 In this letter, I will talk about the lives of children in the Dobromel Orphanage. Each morning, except Sundays, begins with exercise. All children, young and old, begin exercise at 7:00 AM. It’s very interesting to see how they repeat all the commands from the teacher: sit down, stand up, leaning forward, tilting back, squat. Despite the fact that the exercises are simple, many children cannot quickly figure out what is necessary to do, and therefore lag in movement and don’t all turn in unison, although they do try. Ten tables fill the dining hall. Then they wash and get ready for breakfast. Since the dining room is small and there is not enough room for all of the 120 children, the meal takes place in three stages: first, the small children eat; then the middle group eats; and finally, the older children. The teachers supervise the young children while they eat, and control that they eat carefully, and that they eat the entire portion. The green building is the school. of a teacher or educator, only some of the older children are allowed to cross the street. Although this town is small, the movement of vehicles, bicycles, and horses pulling wooden carts is intense near the school. There are no pedestrian crossings, and the road is not asphalted. This school for children with special needs does not offer all of the advanced courses found in most secondary schools. Some of the children have difficulty with numbers and letters, so science in not even a possibility for them to learn. 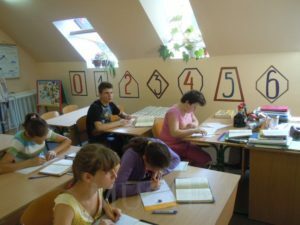 For the higher functioning children, mathematics, history, the Ukrainian language, biology, geography, art, and physical training are the limit to their education. In the spring, the children who have families are called home to plant the crop that will be the family food for the following year. Also, they may care for the cows or babysit the younger children in their family. Between classes, the children go out in the yard near the school. It is equipped with a playground where they have fun, running around or just sitting on the bench and talking. When the lessons end, the teachers and caregivers process the children back across the street where they will have lunch. While the children eat, the older children have time to pose for pictures, and they happily will ask, “Will you take our pictures?” They love to be photographed! After lunch, everyone will return to the school to do homework with a tutor who specializes in helping the children learn how to do homework. Then supper, and after supper, the children have free time to watch TV in the playroom, or play with games. Older children can spend time outside of the orphanage where they play football or sit on a bench and talk to each other. At 9:00 PM, children go to wash, brush teeth, and sleep. Every Saturday is bath day. All are bathed in a shower. Young children are washed by a woman caretaker. These evenings are very lively; the children love to wash and are very excited and joyful, before and after their bath. The children told me about this wonderful event the day before. The brooms are made out of branches. pride in their environment. In this orphanage, almost all children are under the supervision of trainers and teachers all day – for these special children need constant supervision and control. A piece of history in Dobromel. We had a meeting with the Director one day during our last visit. We met outside in one of the little gazebos that is on the property. As we spoke, he pointed to a stone wall that Mark and I have often wondered about. The stone wall that the children and Mark are posing in front of in this last picture is 400 years old. He explained that this is the remains of the wall that encompassed the city of Dobromel in the 1600s. What a treasure to have this historical artifact right there in the territory of the orphanage. What an educational tool. Speaking of great tools, the internet has given us marvelous opportunities in gathering information and communicating from the mission field through my monthly newsletter and in Emails with sponsors. Social media will give Sveta and me the tools to tell our story in words, pictures, and video. As we move through the second half of 2012, please visit our sites and tell us what you think. This entry was posted in branch brooms, Dobromel, education, Facebook, Flikr, Orphanage, Special needs children, Twitter about Ukraine, Ukraine, Wall from 1600 AD on July 14, 2012 by Mark Koehler.